It’s Saturday morning and it’s time for the last of our Christmas guests to head home. 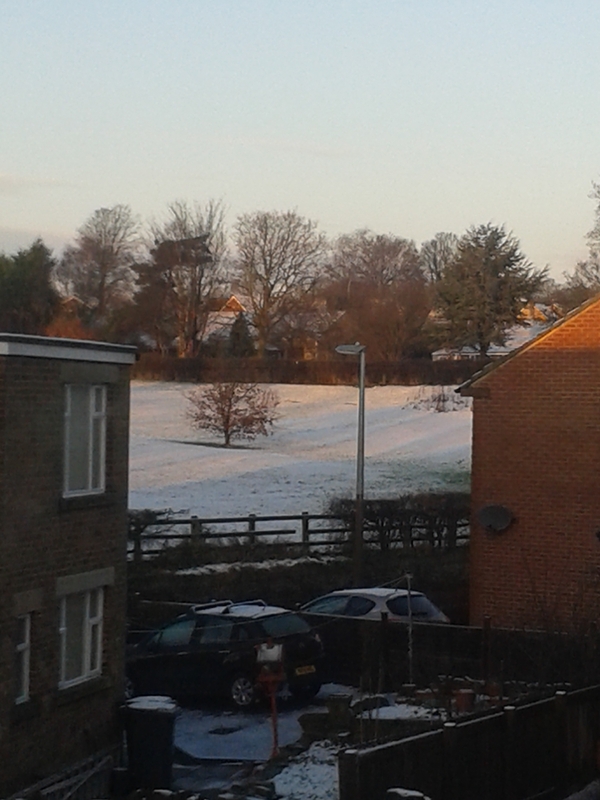 We had some snow fall last night that we hadn’t really expected and it was even settling. 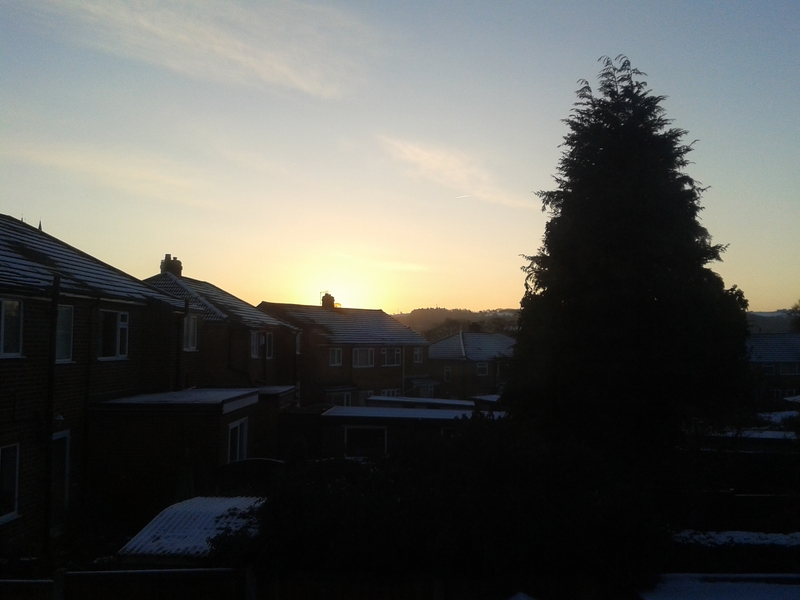 I excitedly looked out of the window this morning hoping for a winter wonderland; a picture perfect crisp sunny day with blue skies and clean white snow under foot. However looking out at 7:30 it was still dark for one thing and it must’ve been raining or milder overnight as there was no snow on the trees at all and not much on the ground, although the school field opposite looks quite nice. So all this means that Christmas is over for another year and its time to take stock. Overall I’d say it’s been a resounding success. 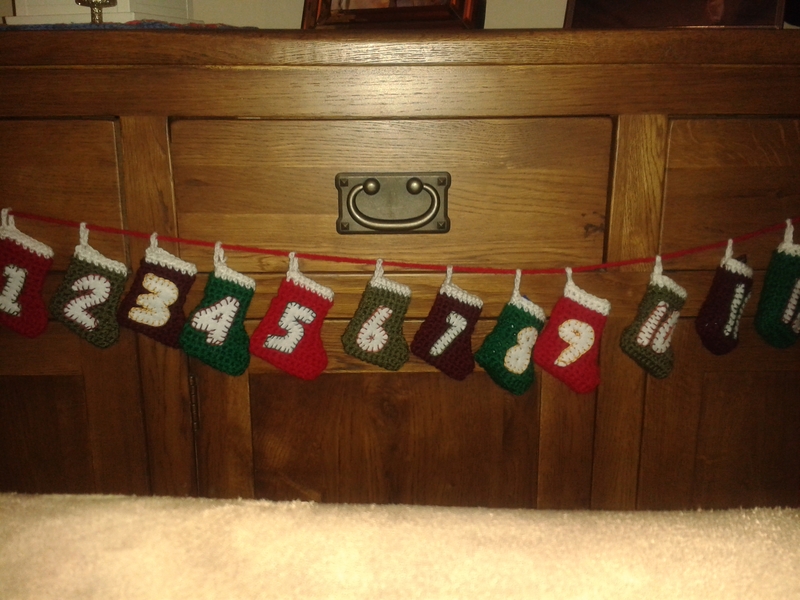 I finally managed to finish the advent stockings on Christmas Eve-Eve, having managed to stay at least one day ahead all through December. Beautiful, don’t you think? I was very impressed. 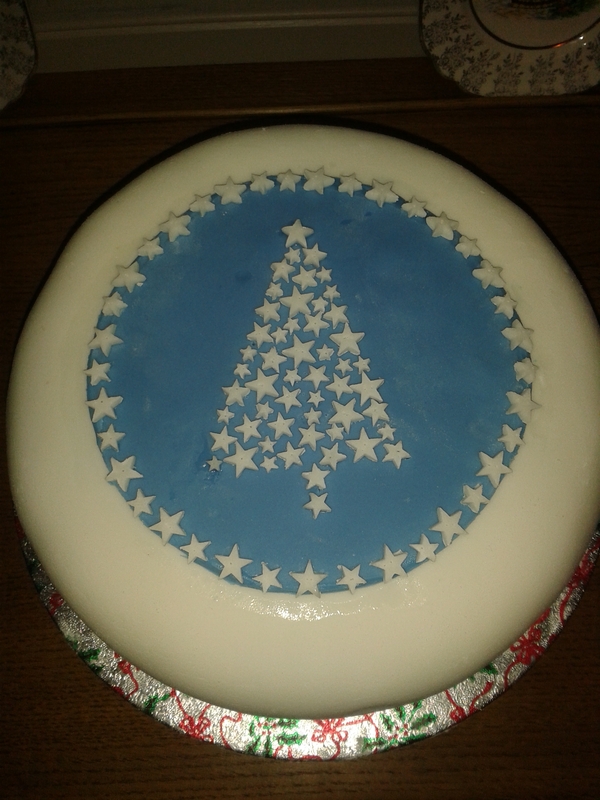 I helped with cutting out some of the stars. It was very fiddly work! And now it’s time to look forward to the New Year. As you could probably expect, I got a few craft related presents for Christmas. 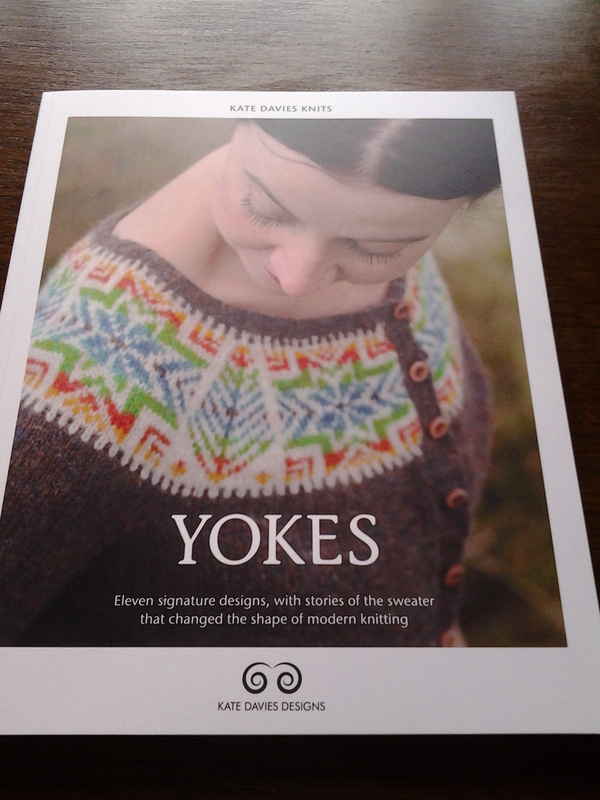 R got me this beautiful knitting book by Kate Davies. I’m very excited to start planning what I’m going to make first. Looking through, the author seems to have used some very well priced yarns, so I might actually be able to work the patterns in the recommended yarns for a change, instead of trying to convert them to a cheaper alternative! I the patterns in this book will help me to work on my approach to colour for the makes I wear. I’m often tempted to use brights as I worry that I’ll get bored and not finish things if I use a muted colour palette but I think working some of the designs from this book will help me to find the pleasure in working with more wearable colours. 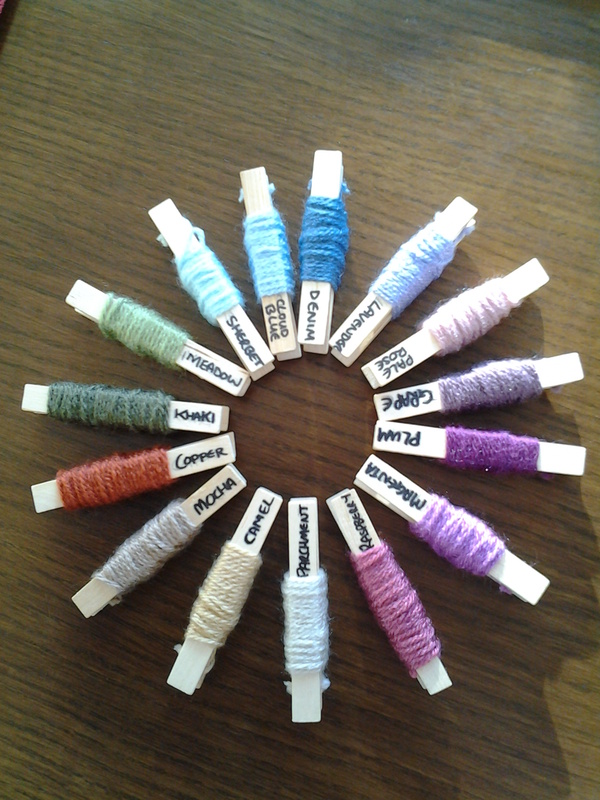 Lucy from the Attic 24 blog hit on such a great idea with these coloured yarn pegs, they’re great for this process of planning the colour order. 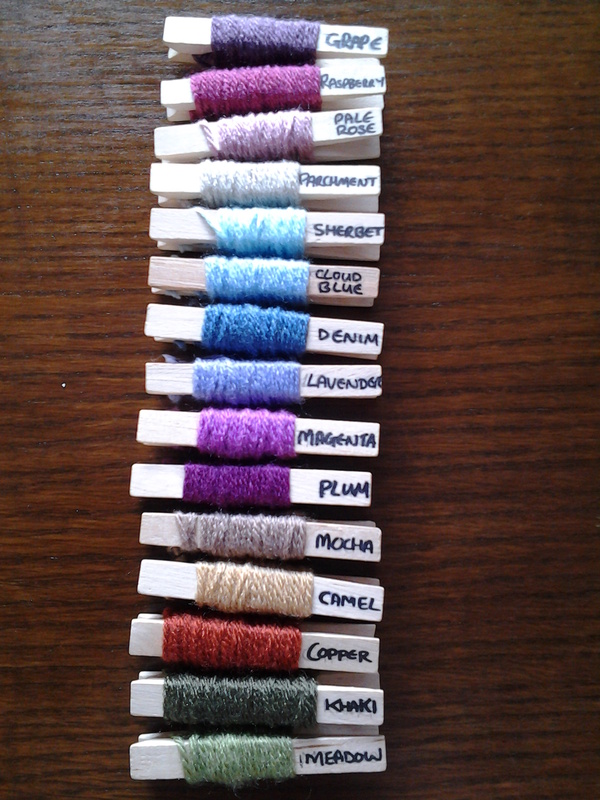 And here’s all that lovely squishy yarn, all ready to play with! It’s been aaaaages since my last blog – sorry about that! Things have been very busy lately and I’m struggling to get everything done (but what’s new). The other day I had an urge to just get something finished. One of my projects that I’ve had ongoing for ages – and there are many of these at the moment! 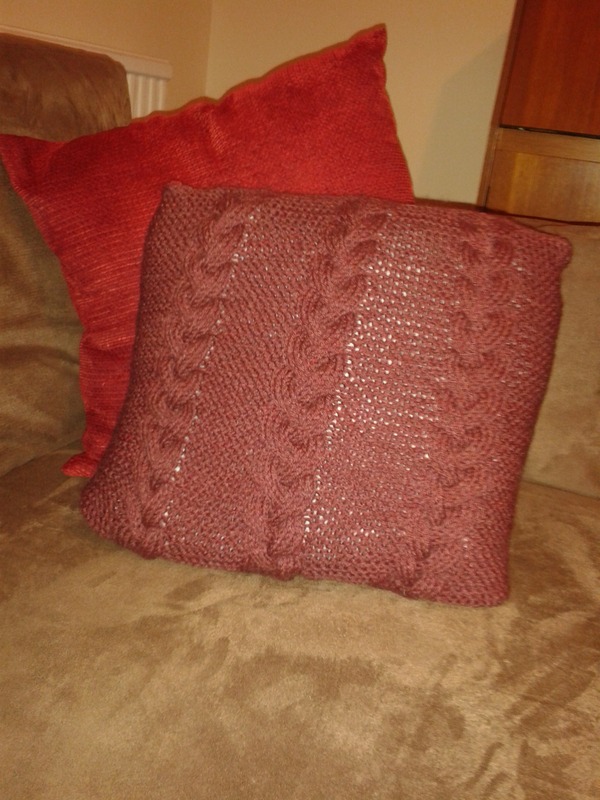 I’ve been knitting a cushion cover for my living room. I wanted quite a chunky but professional-looking finish but was pretty short of cash when I first started this project when we’d just moved house and got back from holiday! 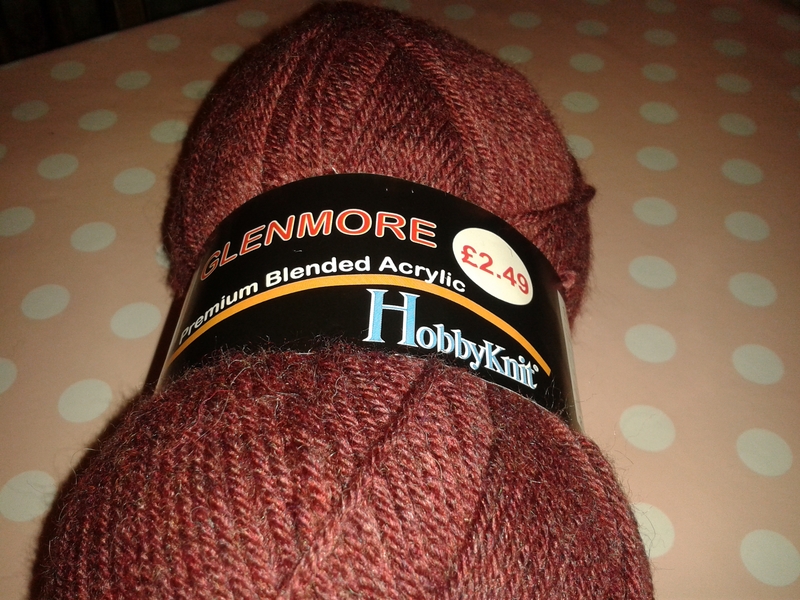 I found some aran yarn in Poundstretcher – somewhere I’d never normally think to look for knitting supplies but I just walked past it and it was the perfect colour. It also seems pretty good quality for an acrylic and is really soft and warm, but best of all it was only £2.49 for a 200g ball! I bought two. 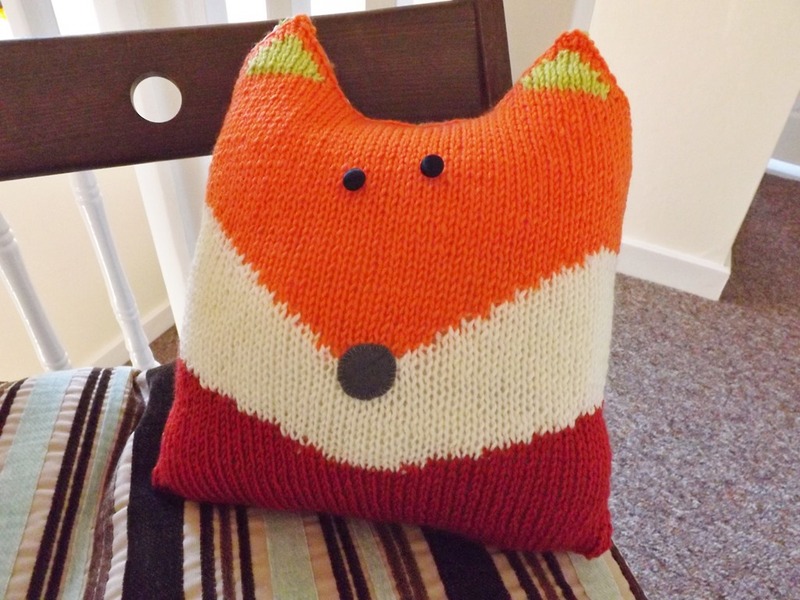 One day I’ll get around to making a matching cushion cover! 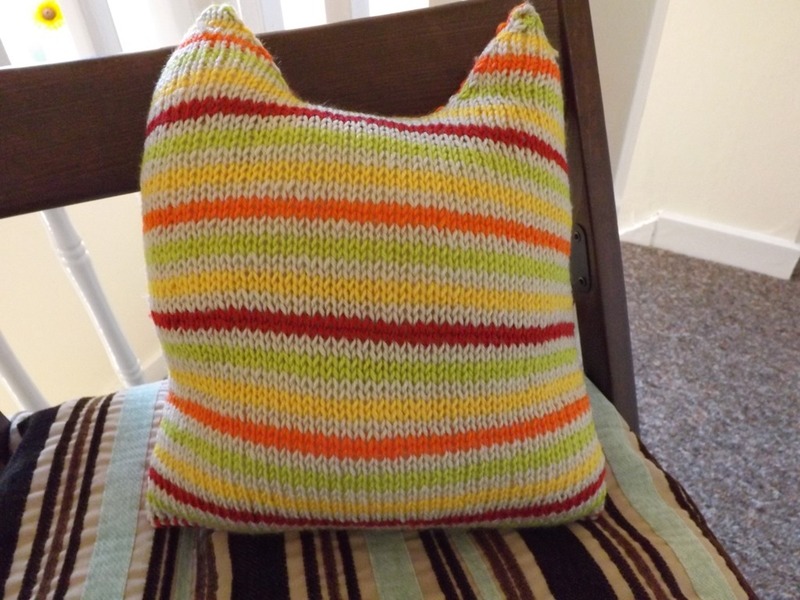 The pattern for the cushion was from The Knitting Book http://www.amazon.co.uk/Knitting-Book-Frederica-Patmore/dp/1405368039 and is called the Strawberry cushion. 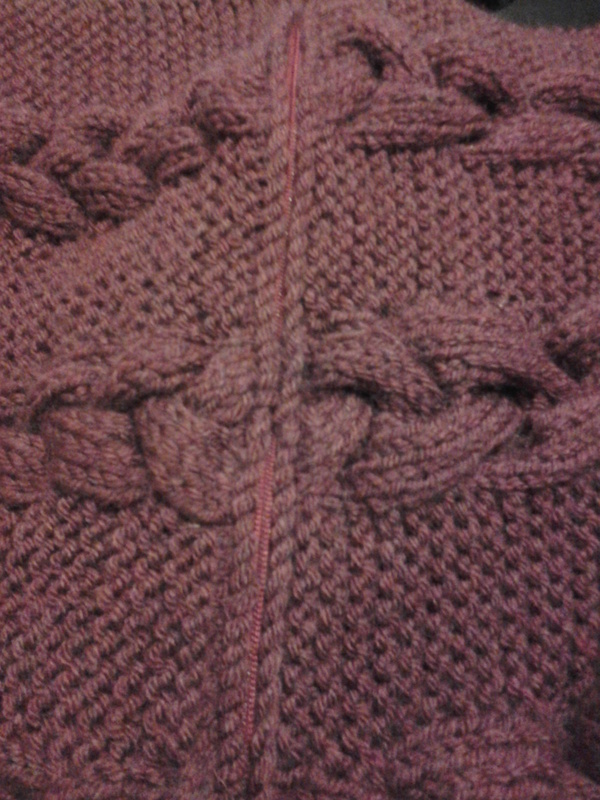 It was easy to follow and the cable stitch was straightforward. The fact that it is on a garter stitch (knit) background made it fairly quick to do once you get going. The two sides are worked in the same way and there is a special “cable” cast on that creates a pretty edge where you sew the zip in. I’d had to look this up for another project previously. It is easy to do and creates a lovely edge. 16 inch long zip, pins, matching sewing thread, contrasting embroidery thread and spare yarn for sewing up the rest of the cover. 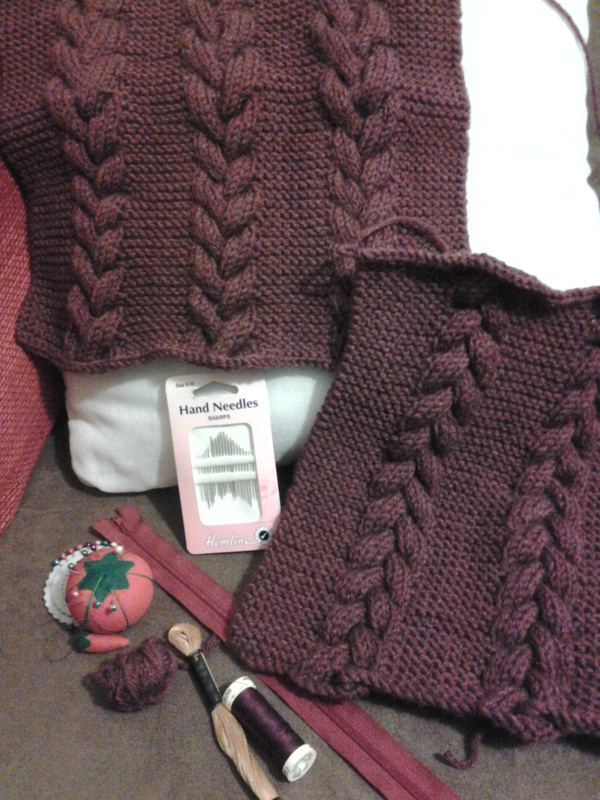 I began with some trepidation as I’d never added a zip to a knitted item before. I followed the instructions in the book and it turned out to be pretty straightforward, if somewhat lengthy. I’ll summarise the process here for you… First I pinned the zip to one side of the knitting, working with the right side facing and pinning the zip to the decorative cast-on edge. I started with the ends of the zip then spaced my pins evenly along the zip. I used lots of pins and the instructions advised to pin at right angles to the zip rather than along the same way. Using the contrasting embroidery thread I then tacked the zip in place on this first side. Then I used the matching sewing thread to back-stitch all the way along the edge and then turned the work over and ran a zigzag stitch along the edge of the zip to secure it to the knitting. 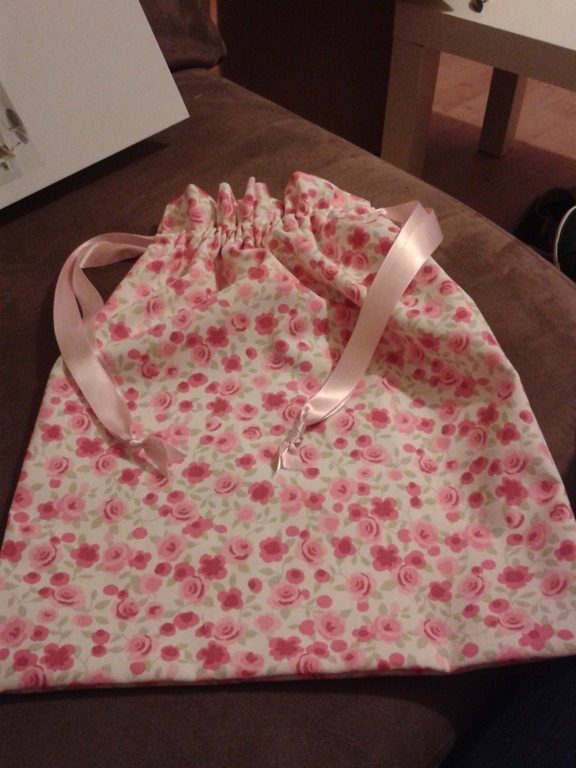 I did everything by hand as I didn’t dare try to do it on the sewing machine. I made sure the decorative cast-on edge was quite close to the teeth of the zip. I then repeated this with the other side – which was a little bit tricky to do by hand as it was quite a big piece by this time and you’re stitching across the middle of it rather than an edge. 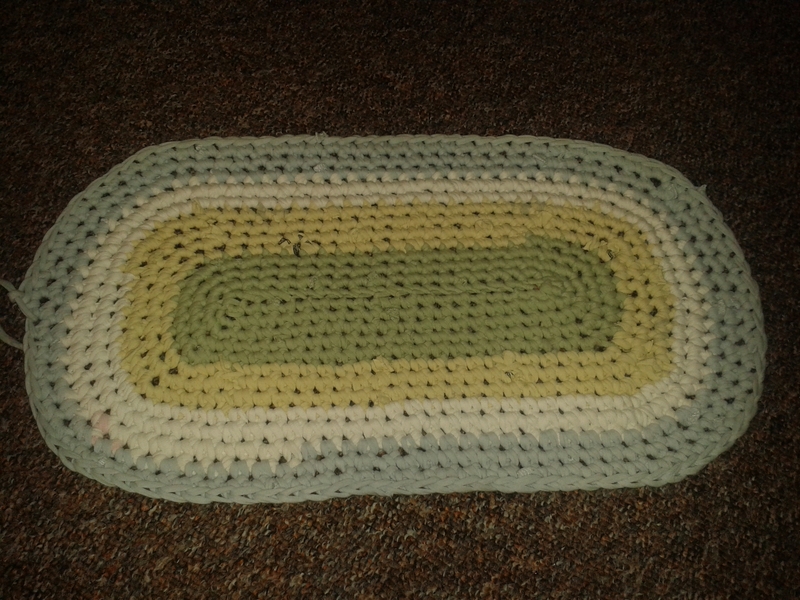 (the colour doesn’t look that great here I’m afraid but in normal light you can’t see the cushion pad through so much). I’m really pleased with it and am looking forward to doing another one later in the winter when I’ve caught up with some other projects. Do you thing I should do another identical one or in a slightly different pattern? I think I’d like to stick with the cable but do a slightly different version – it would be great to hear your thoughts! 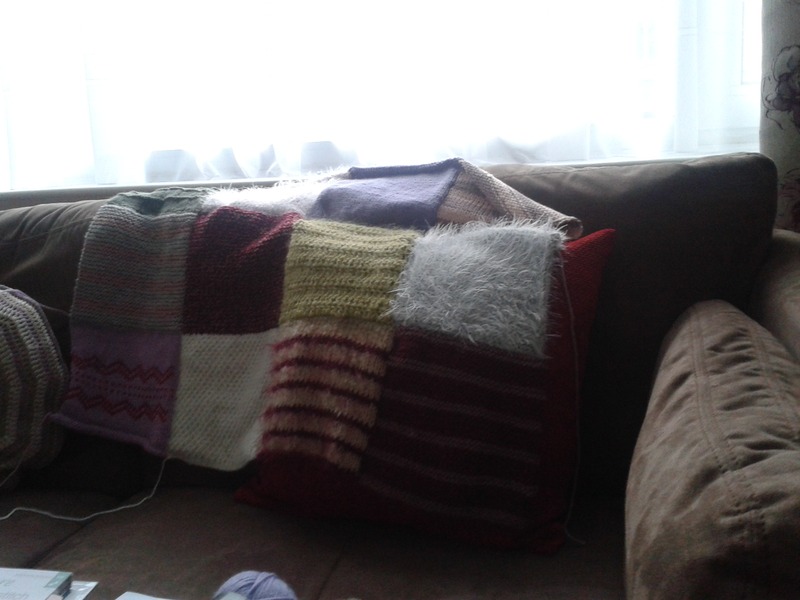 Here’s an update on my patchwork blanket made of knitted and crocheted squares that I showed you earlier in the summer – I still need to make a few more squares but I’ve started to sew them together! Finally before I go, I thought I’d mention that I hope to finally feature some baking on the blog pretty soon! After moving into our house the landlord didn’t provide a cooker so we had to save up for a little while and make do with an electric hob thing for a few months. We finally have a cooker though and I’ve organised a “bake-off” at work which we do every so often in homage to the Great British Bake Off. I can’t believe we’re more than half way through the series already, I don’t want it to be over! He’s positioned on my reading chair on the landing and cheers me up when I walk past! So with the leftover yarn I had from the kit I wanted to make another one of the patterns from the magazine. 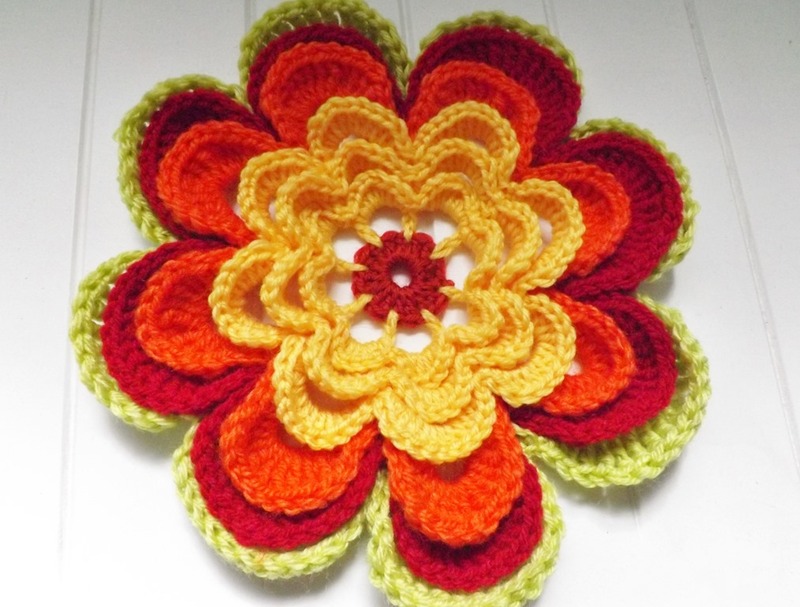 A large, bright crochet flower really caught my eye. I wasn’t sure what I’d ever do with it but just had to make it! I did have to buy a new ball of orange yarn as I knew there wasn’t enough left over and didn’t have anything suitable in my stash. 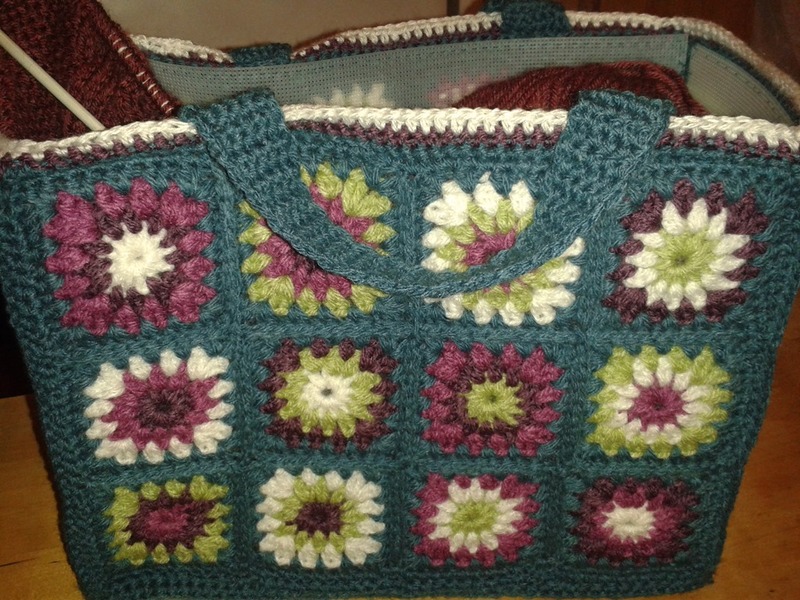 As it turned out I didn’t have enough of the green yarn to finish the last row of petals either so I had to “re-interpret” the pattern from the magazine! 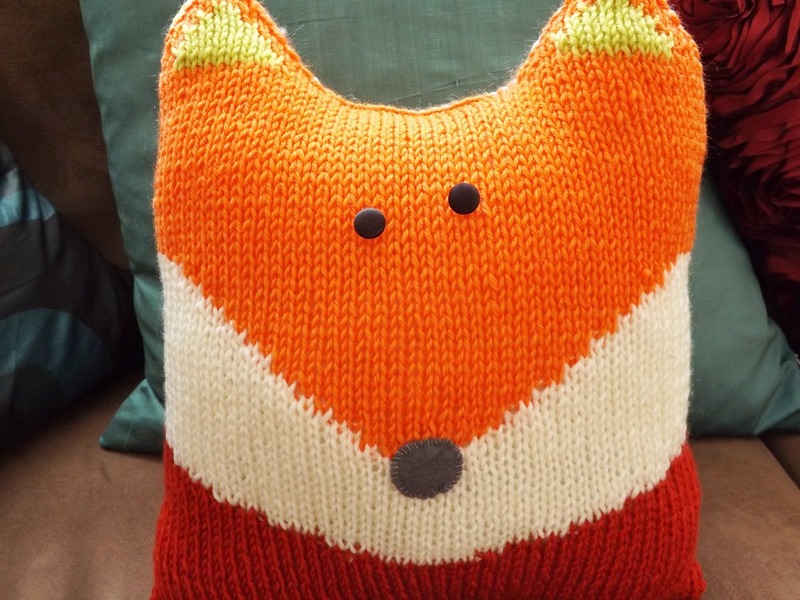 It took a couple of attempts to work out how to complete it with the yarn I had but I managed in the end. 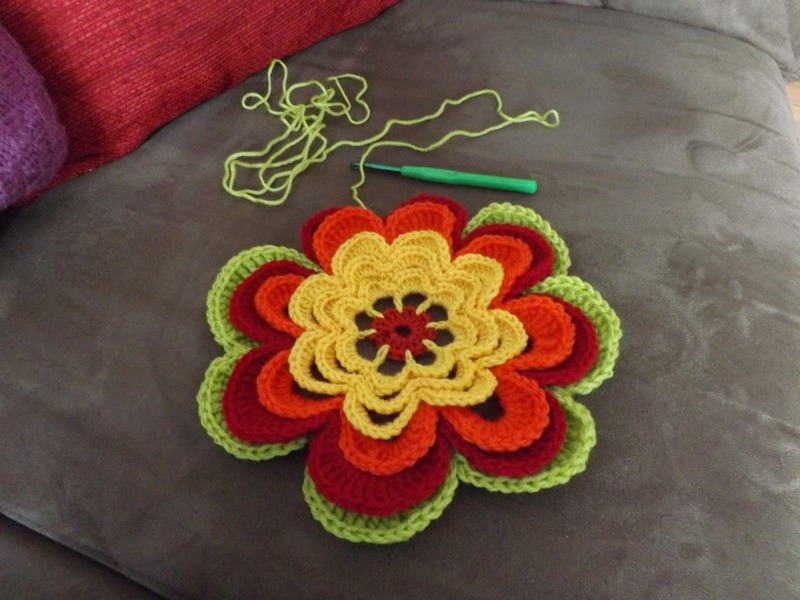 The pattern is created by working a chain (which was meant to be a chain of 18 in the green section but I used 16) to make a series of loops behind the last row of petals and then you go around again crocheting different stitches along the loops of chains. The green petals should have been 1dc, 1htr, 1tr, 2dtr, 16trtr, 2dtr, 1tr, 1htr, 1dc (standard UK abbreviations). I used 2 trebles then 3 double trebles at each side instead of 1 and 2 respectively and only 12 triple trebles in the middle but this was enough to ensure the green petals still showed behind the red ones in front. Ta-da…! Having started out not knowing what to do with it when it was done I think I will try to find a way to mount it in a box frame so that it can go in my kitchen with the big green cupboard (see first post!) and won’t get damaged. What do you think? 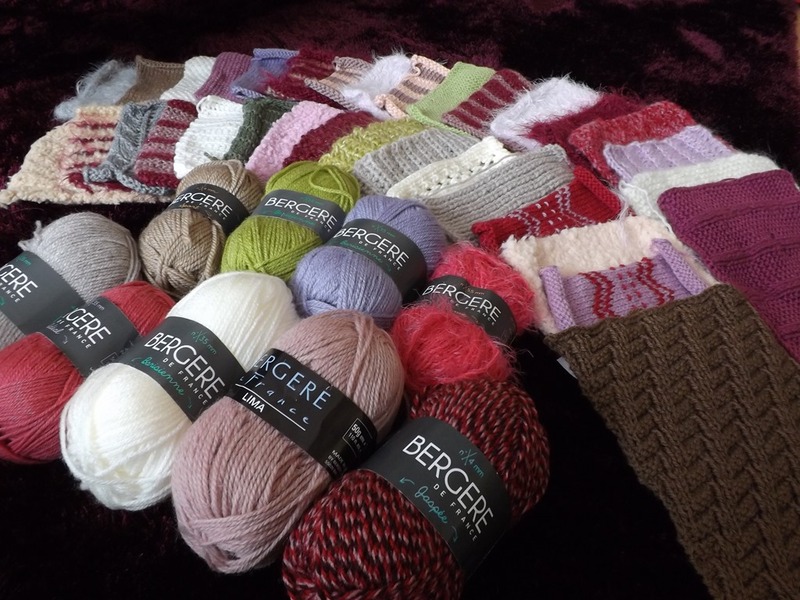 It started out life as the Knit and Stitch Collection from Bergere De France but I got bored of getting the magazines each week for £4.50 when I didn’t like the rest of the patterns very much so I’ve decided to free-style it from now on! Look out for my progress in future blog posts. ‘Till next time… happy crafting! Posted on August 11, 2013 August 11, 2013 Categories Craft, CrochetTags brights, colour, crafting, Crochet, flowersLeave a comment on Let’s get crafting! It’s been great to see that people enjoyed my first post. I thought my next one should be a little taster of some of the other projects I like to do, as I’m generally into doing anything creative! 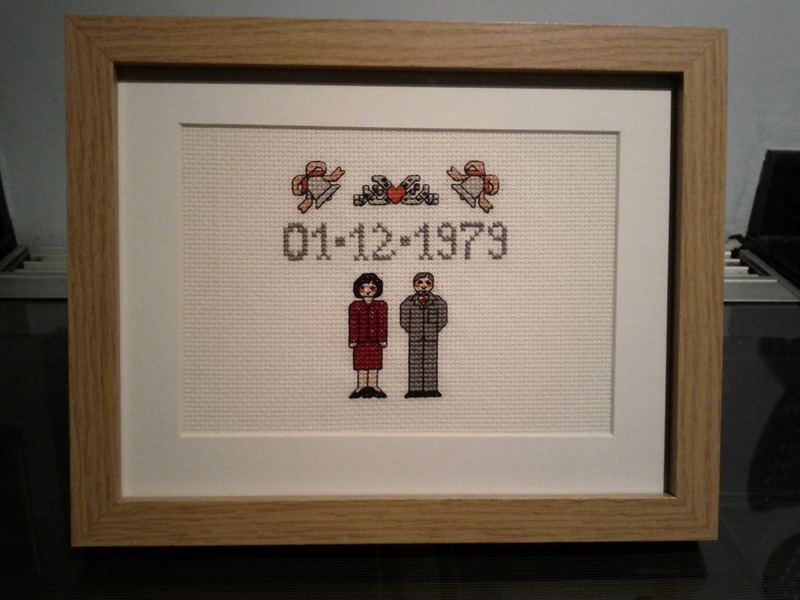 The first is this present that I made for my parents’ wedding anniversary. I put the design together from various motifs in Jo Verso’s cross stitch books. Despite having these books for years (probably over a decade, eek), I’d never actually done that before but I really enjoyed the process. I adapted the colours to match the clothes my parents’ had worn on their big day, and their hair colour etc. I already had loads of colours left over from other cross stitch projects I’ve done over the years, so it was just a case of selecting the right ones. The whole process for this one was really enjoyable – as was the reaction from Mum and Dad when they saw it! 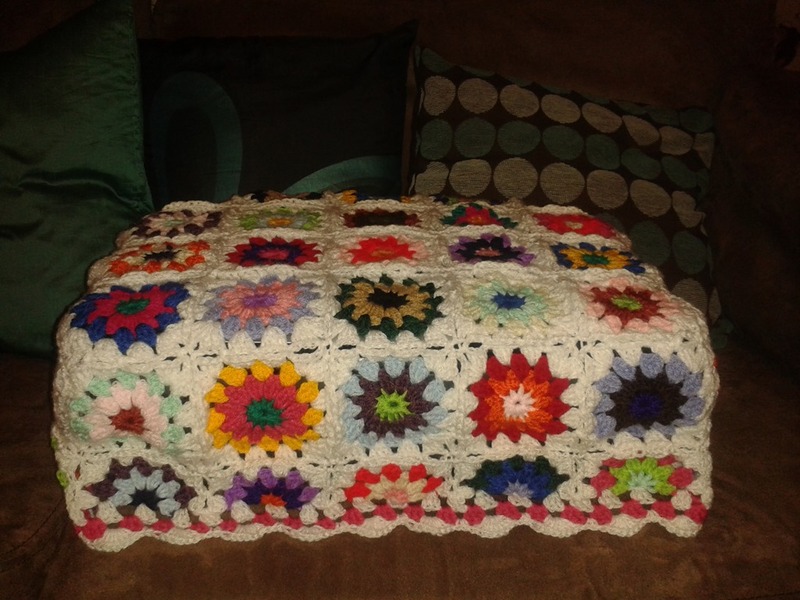 The next few pictures show how much much my crochet skills have improved this year. I taught myself to crochet from books last winter and am loving it. Though I’ve always enjoyed knitting I’d been itching to learn to crochet for ages and finally bit the bullet. My favourite things about crocheting are that the projects seem to grow more quickly than knitting does and it’s also so versatile. Here is my tablet cover that I knocked up on the morning of my birthday to protect my brand new present! 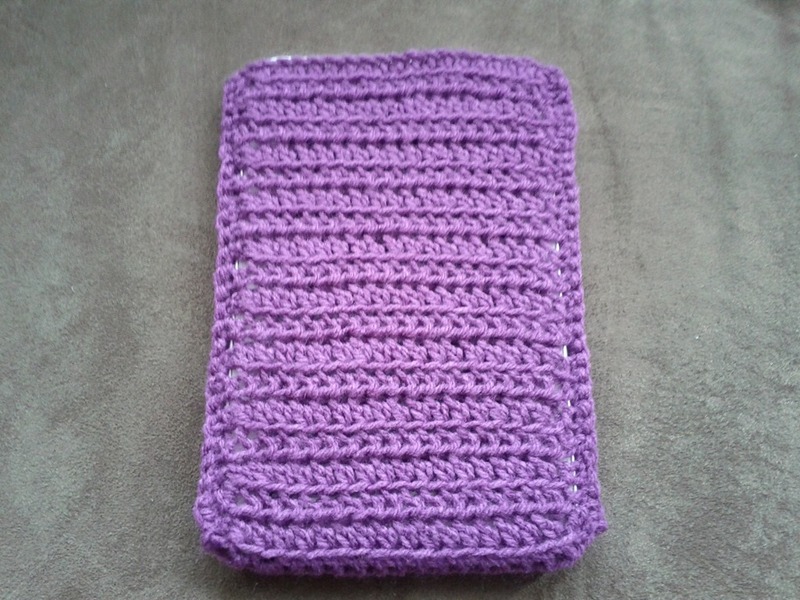 It is basically just a long piece of double crochet that I joined up at the sides with single crochet. Then I started this project from Crochet Today magazine. It was designed to be a basket for a bicycle but as I don’t have one of those I thought it’d make a great craft bag, so I made some longer handles to put on it. It was made from oddments of yarn that I had in my stash so all I had to buy was the plastic canvas to line it and the cotton to sew that to the crochet pieces. I must admit this took some time and I would tend to make a section and then leave it for a while. I probably started this last winter and have only recently finished it but I’m so pleased with the result! I also had to learn the difference between British and American crochet terminology as I discovered that the stitches are the same but have different names! 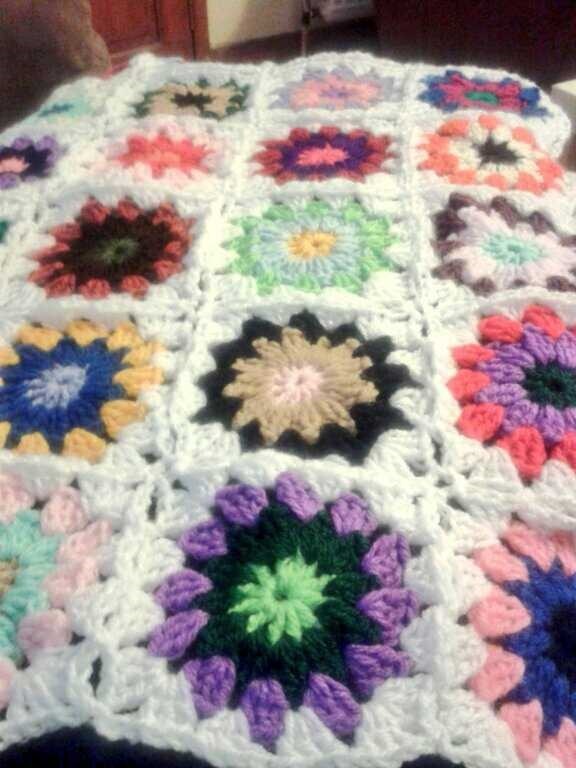 I kind of love the 70’s vibe of the colours and it is definitely my most adventurous crochet project to date. The last crochet project that I wanted to share was inspired by a post I saw on Pinterest. 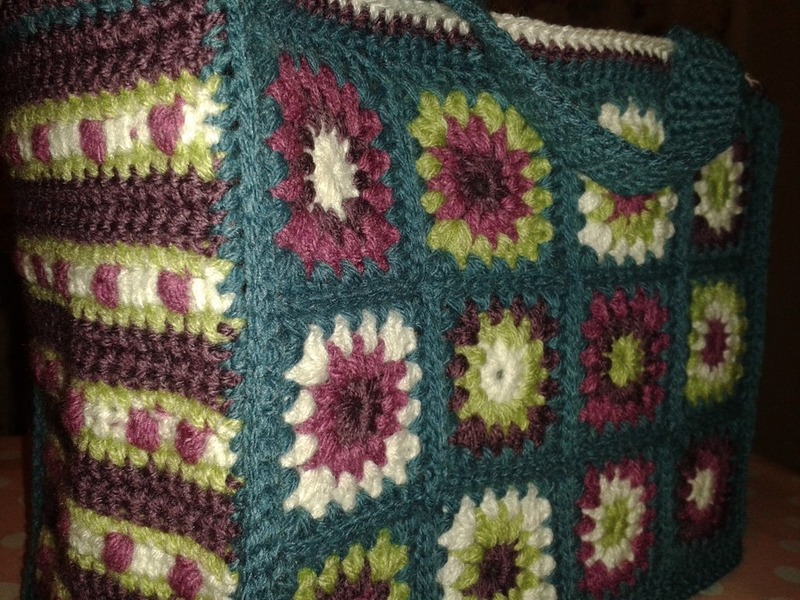 The original pin was for a framed piece of wall art made from 9 granny squares. However, as I had tons of little balls of different coloured yarn I found I just couldn’t stop – and in the end decided they needed to be made into something practical. So they became a cover for my ugly black printer! I had to look online for tutorials for the half granny squares along the bottom row (the printer is deeper at one side than the other) and in the end pretty much just worked it out for myself as I found it easier that way. Finally, I’ve been trying my hand at a little sewing. I’ve “borrowed” my mum’s sewing machine which it almost 30 years old but she’s never really used it much and still works really well. Although it terrified me at first I’m getting used to it now. I was determined to make my own travel laundry bag for our holiday to America earlier this summer so I bought some lovely Clarke and Clarke fabric and some matching ribbon. I started adapting some instructions from Knit and Stitch Collection (Bergere de France) but was freestyling it by the end (as usual)!